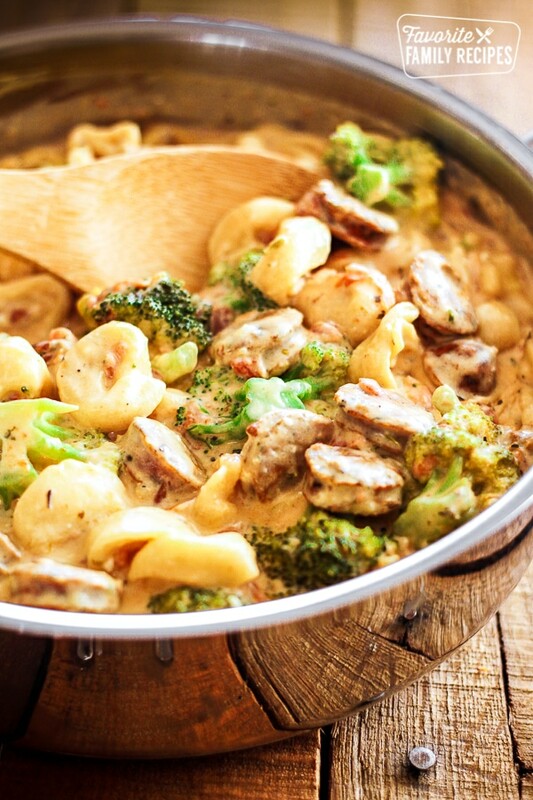 This Creamy One Pot Tortellini with Sausage is a delicious meal that whips up in less than 30 minutes. The seasonings in the sauce make it so flavorful! This One Pot Tortellini is a great meal for when you are in a hurry and need to get dinner on the table quick! Especially this time of year when the kids are back in school, I find myself always falling back on these types of dishes. This cooks up in less than 30 minutes and has everything you need in one pot. You can use just broccoli as the vegetable in this dish or you can use a “garden mix” of veggies (broccoli, cauliflower, and carrots). We have also used squash, zucchini, onions and peppers. If you use onions and/or peppers, just saute them up with the sausage and add a little extra oil.. SO YUMMY. We have done this and added a little Cajun seasoning– oh my. You can be as creative as you need with this dish. I love the creaminess of the sauce. If you want to make it even cheesier, sprinkle some mozzarella over the top right before serving. If you are watching your calories, use fat-free cream cheese– there is so much flavor already in the dish, you will hardly be able to tell you used the fat free. 1/2 bag frozen tortellini appx 10oz. Looks yummy! When do you add the tortellini? Are the herbs fresh or dried? Can I use crushed tomatoes, I really don’t eat tomatoes, but use the crushed ones instead. Would this ruin the recipe? Other than that, the recipe sounds wonderful. How would you do the uncooked tortellini, boil it then add it at the same time as the broccoli? I can’t afford using all that cream cheese – too expensive. Have you used any other alternatives? e.g., some cream of celery/broccoli soup? Or even just broth? I haven’t tried it with any substitutions like that– it would probably be ok with just diced tomatoes. It wouldn’t be creamy but it would probably still taste good! You just add it in– you don’t need to boil it first. 🙂 Hope this helps! Do you happen to have nutrition facts on this? TIA! Just made this tonight for my family and it was a hit! I served it with Cheddar biscuits, it was the perfect compliment. Thanks for the recipe! You are welcome, I’m so glad you liked it! Do you use the shredded Parmesan cheese that is in a shaker, or freshly shredded whole Parmesan cheese? Thanks! I used the kind in the shaker, but you can use fresh if you would like! I’m using buitoni tortellini that I just bought that is in the fridge, I didn’t freeze it. Do I need to boil it first or can I just throw it in towards the end so it heats up? You just throw it in at the end so it heats through. You don’t want to overcook it. Thanks for asking!